Tuesday, June 14th 2016 was an incredibly special day. I spent it with 5,000 women. We discussed hard topics like violence against women, discrimination and the gender pay gap. We prayed multiple times for the victims in Orlando. 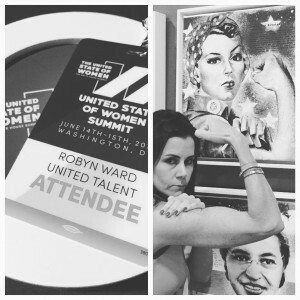 But the United State of Women Summit was not a place of anger, sadness or frustration. Instead, it vibrated with love, optimism and the promise of a future, a not so distant one, where our daughters won’t face the same challenges we do. It was amazing to hear from the likes of Kerry Washington, Patricia Arquette and Amy Poehler, alongside everyday women who had started companies against all odds and built organizations impacting change. It was a day of heroes, but the standout for me was “The Administration”. 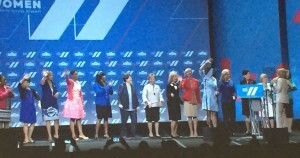 Collectively, I mean POTUS, FLOTUS, Joe Biden, Nancy Pelosi (and all the female congresswomen that joined her onstage), Megan Smith (CTO of the USA) , and Valerie Jarett & Tina Chen (who work for FLOTUS and serve on the White House Council on Women and Girls, which produced this historic, free event). There has been no other time in history where we have had so many folks (women AND men) at the highest levels of government so whole-heartedly dedicated to advancing women and girls. Yesterday’s event crystallized this for me in a way that I am not quite sure I understood. Around mid-day Nancy Pelosi came to the stage. As the first female Speaker of the House, Nancy has an important place in history. Nancy is one tough lady. She told us war stories about rising through the ranks of the male-dominated House. They were stories the crowd could relate to – no matter field of work. At the end, she shouted, “when women succeed, America succeeds”, and then brought out a group of other women from the House onto the stage. The crowd stood in ovation for several minutes to honor these women. We need female representatives in government to make sure are voices and stories are heard and our issues are fought for. Unfortunately, the number of women in politics is going down, not up. Perhaps, HRC winning in November will reverse this trend. The power of “seeing is believing” can never be underestimated! Back in February, David Brooks published a spot –on piece called “I miss Barack Obama”. In it, he writes about President Obama’s integrity, authenticity and sense of basic humanity. The following sentence, in particular, speaks volumes after having attended the United State of Women Summit: “He and his wife have not only displayed superior integrity themselves, they have mostly attracted and hired people with high personal standards. There are all sorts of unsightly characters floating around politics, including in the Clinton camp and in Gov. Chris Christie’s administration. 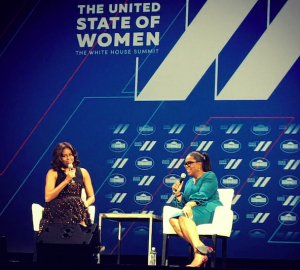 This sort has been blocked from team Obama.” As I stated earlier, the heroes of the Summit were all the folks in “The Administration” that, not only put on the event and gave powerful speeches, but do the work on a daily basis to advance women and girls (and all minorities). Michelle Obama said, “Being President doesn’t change who you are, it reveals who you are.” What the Summit revealed is that we have been incredibly fortunate to have a group of incredible people in our government incredibly dedicated to making women’s rights/human rights a priority. **special thanks to The Girls Lounge for its unwavering devotion to the #powerofthepack and for bringing women across all industries together at events all over the globe.